While the waters will take time to recede, farmers should act immediately to mitigate the long-term impact. Sidney farmer and Iowa Soybean Association Director Jeff Jorgenson is living the nightmare. “This flooding was higher than it was in 2011,” said the farmer from Sidney, a small town located in Fremont County and hit hard by the flooding. “When the Missouri crested March 19, it became a wait and see game. We’re holding our breath and assessing the severity of the long-term damage.” The catastrophic floods amidst a downturn in the soybean prices further exasperates the will and patience of farmers. Jorgenson isn’t the only farmer impacted. Among the 31 growers in Fremont County with grain in storage, over 390,000 bushels of soybeans have been potentially destroyed, with total crop losses estimated at $7.3 million. That number, Jorgenson said, will likely increase as flood waters retreat. As if the ongoing trade war between the U.S. and China wasn’t enough to slow exports, rampaging flood waters took their toll on roads, bridges and rails. "The high and more turbulent river conditions will result in barge transportation being restricted,” said Mike Steenhoek, executive director of the Soy Transportation Coalition. Barges are unable to operate efficiently amidst flood conditions. 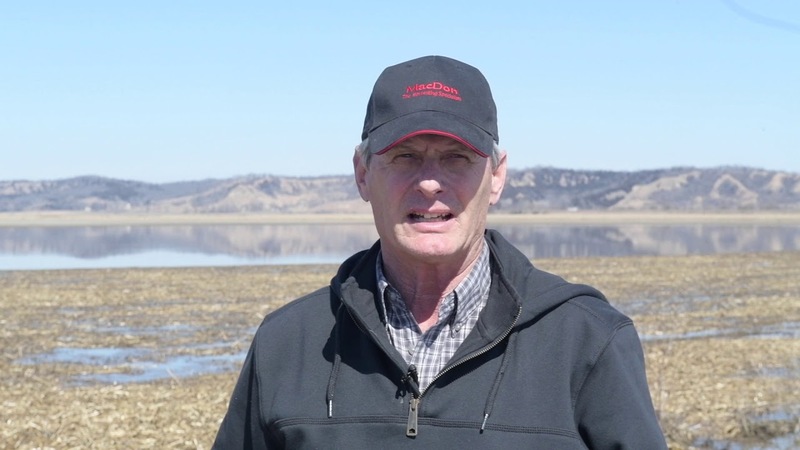 “If a barge loading facility isn’t able to move products efficiently, there will be a decrease in the price offered to farmers,” Steenhoek said. The Iowa Department of Agriculture and Land Stewardship (IDALS) urges farmers to work with their insurance providers and take inventory of any damage. The department’s website, iowaagriculture.gov/news/resources-flooding, provides a list of resources for those impacted. Additionally, the Iowa Farm Bureau has crafted a resource page detailing assistance available for those impacted at https://www.iowafarmbureau.com/Farmer-Resources/Flood-Assistance. Two Fremont farmers, ISA District Director Jeff Jorgenson and Leo Ettleman, say that, despite the approval for federal disaster funding, both residents and farmers still have a long road of cleanup ahead.